Bonalu is celebrated in the month of Ashada Masam (June or July). Bonalu celebrated on Sunday's. In 2017 Bonalu starts on 25th June and ends on 20th July. The dates of Bonalu is June 25, July 2, July 9 and July 16. Bonalu is celebrated on June 25th in Ujjaini Mahankali temple in Secunderabad. Bonalu is an annual festival of Telangana celebrated in Twin Cities Hyderabad, Secunderabad and other parts of Telangana, India. For village Goddess likes Bonam. Bonalu Jatara is a Month long Festival. Goddess Shakti is worshiped as Mahakali or Mahankali. Bonam means food, rice cooked in a new pot which offered to Mahankali is called Bonam. Bonalu is a Hindu festival of the Goddess, Mahankali, celebrated in Telangana, India. Secunderabad Bonalu is on 9th July in 2017. In Golkonda Bonalu will be celebrated Sunday and Thrusday and it will be nine times the first Bonam is on June 25, June 29, July 3, July 6, July 9, July 13, July 19 and last Bonam on July 20. On the auspicious festival day people wake up early and finish their regular activities. People will do head bath and wear new clothes especially ladies then they will buy new pot, in new pot they will cook pongal and rice in it, then they will decorate pot with kadi, pasupu (Turmeric) and kunkuma (Kumkum) then they will cover the pot with lid, after place some neem leaves and will make lid as a lamp. This is called as Bonam Jyothi. Some women dance with balancing pots, to the rhythmic beats of drums in honor of the local Goddess. In Olden Days people used to sacrifice a buffalo, Goat, Sheep in front of the temple. Goddess temples have names such as Mysamma, Pochamma, Yellamma, Pedamma, Dokkalamma, Ankalamma, Poleramma, Maremma, Pochamma, Maramma, Yellammma, Nookalamma etc. At the centuries-old Ujjaini Mahankali temple, women started filing in from 5 am itself with the 'bonam', (a pot carrying rice, jaggery, milk and curd and covered with neem leaves and a lamp placed on it) on their heads. Along with the drum sounds and dances ladies in groups with the neibhours, relatives and family members go to the goddess temple and offer bonam to the goddess. The origin and significance of the Bonalu festival is traced to a major plague that killed thousands of people in 1869. At that Time People prayed for Goddess Ujjaini Mahankali in Maharastra as the people will saved from the disease will built the Mahankali temple. After the temple built people started offering Bonalu every year in Ashad Maas. 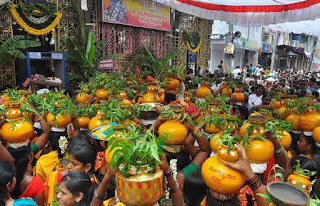 The word Bonalu is derived from the Telugu word Bhojanalu means food offered. People belief is that offering the Bonalu will please the goddess. The Bonalu celebrations begins first at the Sri Jagadamba temple in Golconda Fort. Then Second sunday in Ujjaini Mahankali temple in Secunderabad and Yellamma temple in Balkampet. Then the celebrations will move to the Lalbazar, Old City and other areas of the city. Telangana state declared Bonalu as state festival on June 16th 2014.